The 8100X series multitooth mixers are employed in the applications requiring high shear for achieving a thorough emulsification. 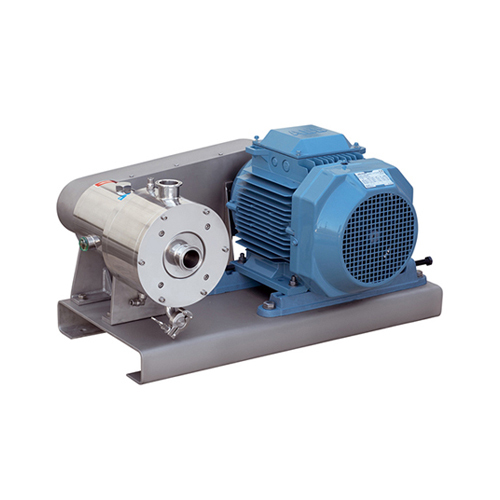 Until now mills and homogenisers have been used for production of high quality emulsions. The 8100X series mixers achieve similar results and present a more hygienic solution at a lower price. Among the products that can be prepared with this mixer there are mayonnaises, high quality body care products, pharmaceutical and veterinary solutions. The traditional rotor/stator mixers produce point shear at the moment the rotor drives the product through the slots of the stator, and the 8100X series mixers are made up of many concentric rows of teeth. 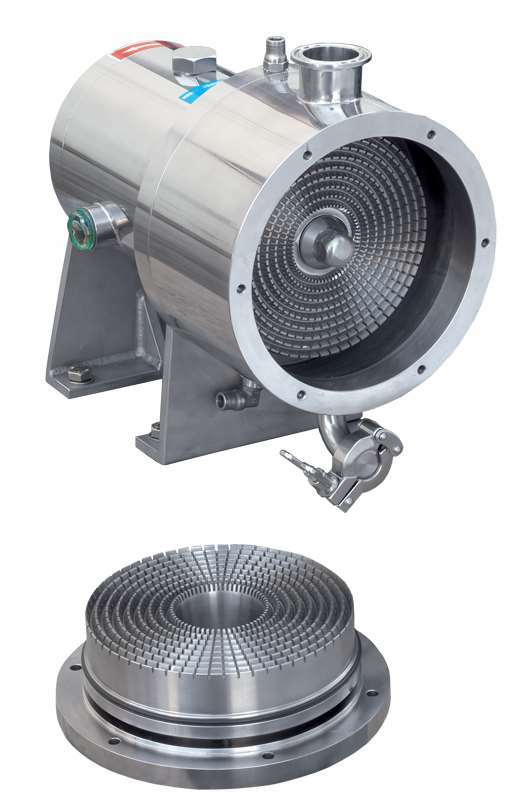 The product enters through the centre of the mixer and moves outward through the radial channels between the rotor/stator teeth. Tolerances are very close, and the tip speed (up to 50 m/s) and the shear rates are very high. High shear. 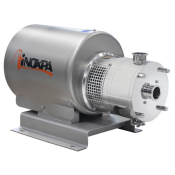 Particle size reduction to less than 10 micrometer. Tip speed up to 50 m/s. Sealing system: sanitary single cooled mechanical seal. Adjustment of different tolerances between the rotor and stator. Assembly with pulleys and belts. Motors: IEC B3, IP 55, F class insulation, 3000 rpm. Other mechanical seal and gasket materials. Speed adjustment: frequency converter or change of relation of pulleys.